A sheep. Yes, those are ears of corn hanging from his underside, LOL. 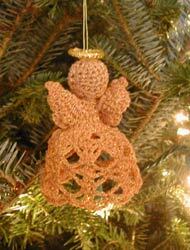 Crocheted angels made by my sister. 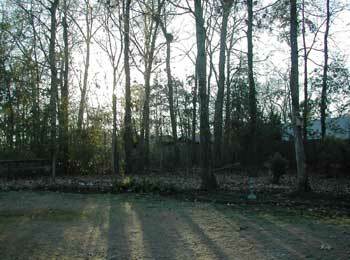 Oh, and the snow is long gone. That’s the beauty of living on the coast. The high today is supposed to be 60Ã‚Â°F. 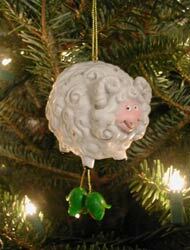 I love the sheep! And the angels are beautiful!! Have a Merry Christmas!! Love the ornaments! 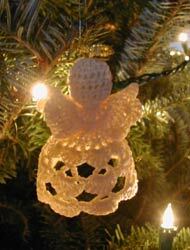 Happy Holidays to you and your family and blessings for a peaceful New Year. the little sheep is too cute! thank you so much for the book thong! it is such an original idea and i always enjoy getting a handmade gift–that makes it extra special. thanks and have a very merry christmas with your family!